Why YOU should sign WoW Petition, today! 9 in 10 (90 per cent) welfare advisors said that too many disabled people are slipping through the net and are left without adequate support by the welfare system. Mencap have also raised concerns over whether there is enough understanding of the way learning difficulties affect people, and how this impacts on a person’s ability to work. Despite all this, GP Philip Peverley has recently claimed that: “I had considered, at one point, putting, up a portrait of Professor Stephen Hawking in my consulting room with a caption that said, ‘This bloke is not on the sick’.” To those who are entirely unaffected by the benefit cuts, and have no reason to disbelieve the skewed headlines produced by some sections of the media, this kind of statement may well make sense, and is the kind of logic behind the Goverment’s portrayal of benefit claimants as ‘scroungers’. However, to think this, and indeed, to declare it publicly is to completely gloss over a whole host of issues which he may well know nothing about which prevent disabled people accessing work, and a host of medical issues which make work difficult, some of which I have described below, This is to say nothing of possible discrimination, access barriers including need for specialist equipment not covered by Access to Work Grant, difficulties getting to and from work, and lack of transport to get there, extra costs, pain, fatigue… the list goes on. I admit there may be some truth in some of what he says including that some people well enough to work to everything to prove they are too ill to do so. If there weren’t there would be no need for reforms, however, the levels of fraud are not nearly as high as the Government would have you believe. However, according to the article, “A poll of 4,000 family doctors by the Department for Work and Pensions in May showed three quarters feel that – even when there is no medical need – they are obliged to issue sick notes to patients”. This may well be true, and it is not the first time I have heard a GP asking that they could opt out of assessing patients fitness for work. If not they, then who? GP’s position as ‘Gatekeepers’ to NHS services makes them ideally placed to have overview of the main issues affecting a patient and the clinics they see and services they receive. I have already established that ATOS are in no position to do this on GP’s behalf, despite Peverley’s claim that “ATOS nearly always gets it right”!! 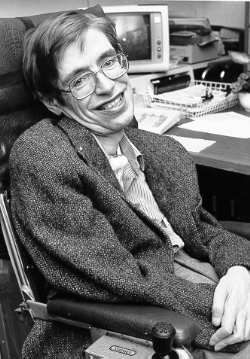 He has also failed to acknowledge that Hawking is able to to pay for costs associated with his disability in ways that the majority of disabled people can only dream of. Money means access to better care, better food, higher quality housing and a better quality of life in general. This will have a positive affect on his impairment, despite its severity. He is so intelligent he can work using his voice only and has all the support he needs, something very few disabled people can say. Journalist Sonia Poulton‘s response to this article was to post a tweet containing Peverely’s reg. number for the General Medical Council for anyone who wished to complain!! The last time I worked was in 2004. I did the kind of office job referred to in the article. I did full time (8.30-5.00) work for 6 weeks to cover sick leave, in the summer holidays while I was a student. For two weeks, I walked to work while my parents were on holiday, or I got a lift from colleges if they passed me on the way to work. Otherwise, my Mum drove me there and back. I don’t remember if there were steps in front of the building or not. I do remember that there was a lift. This was in the days when I was still on my feet, without a walking aid, or a wheelchair, except I used a scooter in term time to negotiate university grounds. I was also on minimal medication, and no prescribed painkillers. This was the year before my diagnosis of Chron’s disease too. This is all significant, because by the afternoon, I would have severe shooting pains from my hips to tips of my toes, and often stomach cramps too. I would be so tired I would have uncontrollable giggles, and my speech would be slurred. How very professional. I struggled to concentrate to do meaningful work, and I made mistakes. I was never disciplined over it though. Clearly not capable of office work, despite this doctors claims. What about if I were to attempt this work today? Well, before I got to work I would have to be up very early because it would take me a long time to get ready. If my carer phoned in sick, the office may not be able to cover it, as I am often the first name on the rota, and not every one can work that early. Even with care, I often have to go back to bed to sleep off the effects of a disturbed night, or the effort of getting up and organised. If I did not do this, I would be asleep at my desk. This is often the case even try to write blog posts, which is why there was no post on Wednesday this week. What about getting to the office? I am unable to drive because the part of my brain responsible for spatial awareness is too damaged, and reaction times were so erratic in the simulator during my driving assessment the Occupational Therapist advised that I would need to use hand controls to be able to drive but that I lacked the necessary co-ordination. Getting the bus is also out of the question, as I do not have the strength to propel my annual wheelchair on my own, and my electric wheelchair is too big. Taxi it is then. However, most taxis are the wrong size or shape to fit my wheelchair, and those it will fit are in demand. Even if I can get one, there is often no space between my head and the roof off the car, causing me a head injury if it crashed. I have been in town before, and even though I have pre-booked a taxi to take me home, none will turn up. I would need a motability van, but as I can’t drive myself, I would need a PA to drive one for me, even though funding is being squeezed in every budget including Access to Work, and the list of things which can be funded is now minimal. Add in cuts to social care and the disappearance of the Independent Living Fund in 2015 and this is an impossibility. (To read about the impact of these cuts on another disabled person, click here to read an excellent piece for the Indy’s Comment is Free by Jess Thom). Assuming I could get there, I would not consistently be able to do any work for so many reasons… My pain killing medication exhausts me, making my speech slurred, and even then it does not take away all of the pain, and I often squirm in my wheelchair due to back pain, and other pain I cannot write about in a public forum. Then you add in the times my ileostomy bag bursts (which I cannot change by myself, and the bladder spasms causing me to wet myself. Have I forgotten anything? The last time I filled in a WCA form there were at least 3 or four extra pages of close written small script explaining my disabilities and the effect these have on my day to day life, including all the equipment I need to help me. Still think I can work? This post is in response to last night’s Dispatches programme on Channel 4. However, you should be able to follow this post even if you haven’ t seen it. It is also in response to the ‘daily post’ as it is the antithesis of my ‘happy ever after’. Read on to find out what my happy ever after actually is! Disability Living Allowance (DLA) currently costs the UK economy 12 biliion and is paid to 2 million adults. The government wants to save two billion pounds by taking half a million people off the benefit. ‘Dave’ says anyone who has had to fill in the forms knows they need changing. He’s only half right. Anyone with a dependant adult who can do nothing or almost nothing for themselves is relieved that they can simply tick a few boxes, instead of revisiting the hell of the current form making them list everything the person could not do and why, causing emotional harm to the person who fills in the form. For anyone else whose severity of disability falls in between two check boxes or fears they are unlikely to qualify, their fears are overwhelming and varied. It is all of this which has given rise to the documentary. Esther McVey, the current Minster for Disabled people, says DLA did not take account people whose disabilites weren’t physical. However, I have read a blog by a blind person who gets money towards aids and mobility now who fears they will get nothing from PIP, read a news article about a woman with profound and multiple learning difficulties who was assessed as fit for work, and read a carers opinion that while the understanding of mental health problems was limited on the DLA form, on the current work capability assessment forms it is even worse. Who is to say the PIP form will be any different? Also a major difference between the two benefits is that DLA focused on ‘self-care’ where appropriate wheras PIP focuses largely on people being ‘cared for’ therefore ruling out hundreds of people. I guess this is the governments aim, but it puts understanding of how disability affects people back by 20 or 30 years. Esther Mcvey the minister for disabled people argues we need a benefit which is “fair, clear and sustainable”. Few would argue with that. However, the Goverments arbritary restrictions on how far a person can walk being the condition for the mobility part of the benefit causes problems for thousands of people who can walk it but it would take them a long time, cause them to be excessively tired, or be in excruiating pain, or a combination of all three for some, including me. Add in the thorny issue of public transport which also affects thousands and you have problems galore, as adepitan explained in the documentary. The DWP’s statement says that the 200 metres has to be completed in a timely, safe, and reliable way. In my opinion this may well be the saving grace for many like Christansen and Baker. However, this caveat was only re-introduced thanks to a successful campaign by disability activists after the government tried to remove it. Re-assessment is another issue. People were previosly on benefit for life if their condiction wouldn’t improve but now will be tested regularly. Lawrence clarke argues that he is asking for the support he needs to take control of his life and how is reassessing him saving money. Esther Mcvey says 50 percent of people don’t have medical evidence to back their claim, however if goverment wanted evidence they’ed only have to ask to see the form I submitted when applying for income benefit or ask to see my MASSIVE medical notes. However, is this type of documentary helpful in raising awareness of the issues both to disabled people themselves, and the general public, or is it simply scaremongering, ramping up people’s anxiety unnecessarily before they’ve even seen the final form? There are more concrete worries as well because the company being paid almost £400 m to assess people has a “controversial track record”. I have to say, that is some understatement. ATOS are the French IT company who asses people’s eligibility for income replacement benefit called Employment and Support Allowance if someone is unable to work. However, ‘widespread protests’ by disabled people and a cost of appeals against desicions of £50M a year; 40 percent appeal and 40 of those desicions are overturned. None of this is likely to fill disabled people with confidence. Even the ‘Public Accounts Commitee’ have roundly criticised both ATOS and the DWP. ATOS however deny everything and say less than half a percent of appeals are now due to mistakes in their reports. Esther McVey disagrees too saying ATOS keep within the government’s “strict rules” and disabled people are entitled to give their opinions on the process of assessment. Sorry… but is the disability minister even listening? There are further questions over whether ATOS are fully prepared and qualified to carry out the new assessments. Many, apparently, will be undertaken by physios. Sorry, but a physio does not have the medical training to understand the problems my surgery caused and continues to cause, or the way one thing impacts on another. A former marine casts doubt over the thoroughness of the assessment process and says the nurse was shocked at the sight of his prosthetic. It doesn’t bode well! He did however win his appeal. Barroness Tanni Grey-Tompson says changing DLA itself was preferable, but the goverment wanted sonething that didn’t sound so big and expensive! People are either superheroes or scroungers, regardless of fraud figures, she says. I have to say I agree with her! By enlarge, the government have the mainstream media on their side in helping to perpetuate these myths in my opinion. Barroness Grey-Thompson says she “doesn’t want to see disabled people ghettoised and locked away” as all progress made by disabled people will be lost. “DLA has allowed disabled people to live independently in a society that’s not really built for them” says Adepitan. For me this is the crux of the issue, and in my opinion something you only fully understand once you are in that situation yourself. Only time will tell if some of the worst fears are realised. Today’s daily prompt asked me if I am living my “happy ever after” and if not, what would need to change for this to happen. In an ideal world I’d be married to mr right, be able to cope with a least one bairn and potentially be working! oh and be living in a supportive, understanding society!! Realistically, I’d settle for the cuts being more widely spread, and for the current reforms of both DLA and the NHS to be revoked. Instead, DLA would be reformed from within with a different, capable contractor at the helm. As for the NHS, current attempts to privatise it would cease and money would be saved by the implementation of effective, preventitive measures, and more front line staff would be employed not less, all saving the government pots of money in the long-run. The end.